When it comes to the events industry, nothing is truer than the old adage that goes along the lines of 'Fail to prepare, prepare to fail'. Planning is the cornerstone of our industry, yet often there are outside forces that conspire against us, that don't read the script. As an event organiser, you'll be thrown numerous curveballs that threaten to ruin the smooth running of your event, unless you make contingency plans to counter them. Of course, you can't plan for every eventually, but you can foresee some situations cropping up. If you've a lot of delegates flying in then there's a fair chance that at least one flight will be delayed, someone will miss their connection or a bag or five will go astray. And you know how it is when the computer that's performed faultlessly for three years suddenly develops that blue screen of death five minutes before showtime, or one of the last minute delegates happens to be a vegan, when the meaty menu has been arranged with the hotel for months. So some things can't be helped, or foreseen, like the infamous ash cloud of 2010, but put yourself in the mindset that something might go wrong and you stand a better chance. Think of all the things that might go wrong and write up a plan B. Take that spare computer and make sure you know the local taxi number for when delegates arrive late. Even when you're running lean, try to make sure you at least have some kind of contingency for when things go wrong. On my events, I always try to have a spare member of staff (preferably with local knowledge) to be my firefighter, called into action when things go wrong. He's the guy that picks up the stragglers from the airport, goes shopping to replace that lost luggage, runs errands all day long and still signs in guests with a smile on his face. Running an event means being nimble and decisive. It also means not showing that you are stressed to delegates. 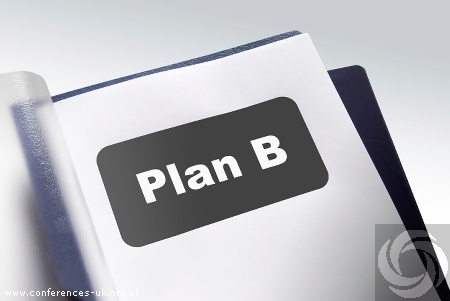 Planning well yet accepting that things will go wrong is part and parcel of organising an event, so make sure you've got a plan B up your sleeve. Believe me, you'll need it one day.